Plastic curtains in the network room prevent the hot air behind the server racks from mixing with the colder air in front of the server racks. To help our equipment function optimally while continuing to save energy, we manage the temperature and airflow in our data centers and machines in simple, cost-effective ways. We raise the thermostat to 80°F. One of the simplest ways to save energy in a data center is to raise the temperature. It’s a myth that data centers need to be kept chilly. According to expert recommendations and most IT equipment manufacturers' specifications, data center operators can safely raise their cold aisle to 80°F or higher. By doing so, we significantly reduce facility energy use. We plan by using thermal modeling. We use thermal modeling to locate “hot spots” and better understand airflow in the data center. In the design phase, we physically arrange our equipment to even out temperatures in the facility. Even after that, we can move certain equipment like computer room air conditioners (CRACs) to reduce hot spots and even out the ambient temperature—ultimately reducing the amount of time the CRAC must run. We find inexpensive ways to manage airflow. Use blanking panels (or flat sheets of metal) to close off empty rack slots and prevent hot aisle air from seeping into to the cold aisle. Hang plastic curtains (like those used in commercial refrigerators) to seal off the cold aisle. Enclose areas with components that run hotter (such as power supply units or PSUs) with plastic curtains. These efforts help to reduce the total amount of energy used for cooling. At the same time, they ensure that the cooler air we send into the cold aisles is truly cool enough to do its job. 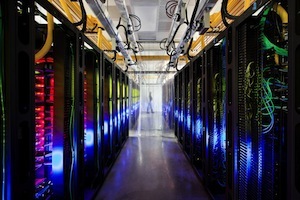 Google data center gunakan server custom. Mengukur efisiensi data center Google. 5 cara Google mencapai efisiensi data center nya.